THE use of plastic money has seen a surge in the number of locals visiting Matopo National Park, a sign that domestic tourism can prosper with the right policies. Matopo National Park tourism manager Mr Emilon Magodhi said the growth of domestic tourism has seen the number of visitors flocking the international acclaimed tourist destination’s various attractions in the last few years. Point of Sales and mobile money there is vast improvement,” said Mr Magodhi although he could not give numbers offhand. He said the number of international visitors has also been on the rise but that of regional tourists has been low largely due to the high exchange rate of the United States dollar against other regional currencies. The country has since 2009 been using multiple currencies but the strengthening of the dollar slowly phased out the other currencies in Zimbabwe’s multi-currency basket. “In terms of the international visitors, we have seen quite a number over the past few years. The figures are actually improving and we also give credit to our local tour operating companies that are registered to operate in the park, because they are the ones bringing the international clientele. In terms of the regional market the figures are low, maybe it’s because of the exchange rate. Our main regional hub was South Africa, but the figures have been stagnant. When we say international we would be looking at all the countries outside the Southern Africa Development Community region,” said Mr Magodhi. Matopo National Park is a world renowned tourism destination that is one of the United Nations Educational, Scientific and Cultural Organisation heritage sites. It offers wildlife, natural and cultural attractions for the local, regional and international visitors. The park has a number of activities and attractions which include rhino safari tracking, fishing, game drives, bird watching, walking trails, rock paintings and other cultural sites, horse safari rides, hiking trails and scenic balancing rocks. 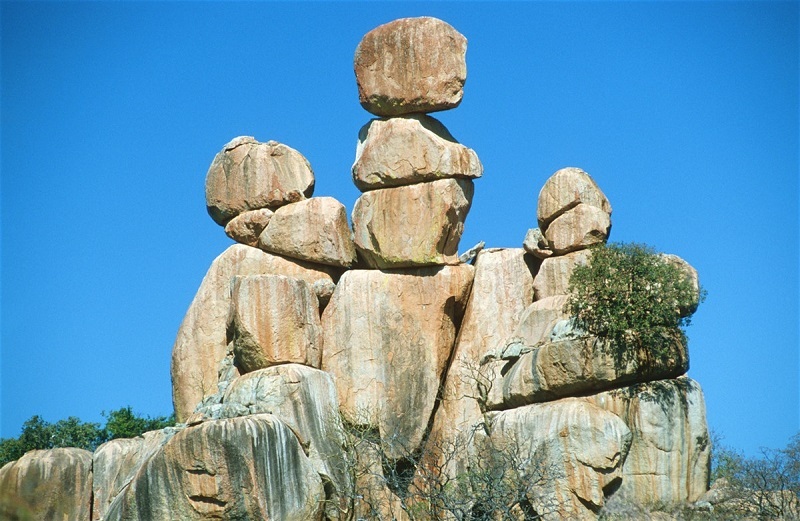 “Matopo has got one of the best rock painting arts in Southern Africa as a whole in the form of Bambata rock paintings and we also have the Nswatugi and Pomogwe caves but to mention a few that are within the Park. “We have the rhino safari walk, which is our key selling point, at the moment. You actually get closer to the rhino. We have quite a number of hiking trails with the popular being the Pomogwe . . . then we have Katugwe hiking trail, these are some of the hiking trails that are around the park,” said Mr Magodhi. The park offers water attractions and activities such as fishing, boat launching and camping at its dams namely Maleme, Mtsheleli, Togwana and Mpopoma. At all the dams, one can do camping and picnicking except for Mpopoma. “Camping grounds with ablution facilities are available at Maleme, Mtshelele, Sandyspruit, Arboretum and Togwana. All campsites apart from Arboretum are situated near attractive dams. At the campsite, each site has a braai area where visitors can cook, socialise and relax. Firewood can be purchased at the entrance points or at the tourism office at Maleme. There is no dangerous wildlife in the park and visitors can feel safe as they enjoy the beauty of their surroundings,” said Mr Magodhi. Zimparks is in the process of refurbishing its major accommodation facility, Maleme Lodge in line with international standards. The refurbishment work started in 2015 and is expected to be completed by 2020. Maleme has well-constructed brick lodges and chalets under thatching with all the accommodation being separate self-catering units totalling to 19 lodges and five chalets. Fourteen lodges have two bedrooms with three beds and four have only one bedroom with two beds. The chalets do not have their own bathroom and a communal ablution block is situated nearby for guests accommodated in these units. “We started renovating in 2015 and we are just doing it gradually. We are looking at probably completing the renovations work in 2019 to 2020. We are continuously revamping all our facilities from time to time, not specifically looking at Maleme only, we have camping and picnic sites that we continuously revamp, its continuous face-lifting though of course we are more focused on lodges,” said Mr Magodhi. He said the refurbishment was being carried out using the revenue the park accrues through charging people to access its attractions. “We don’t have a specific budget on how much we anticipate spending for the renovations. We are doing the renovations on an annual basis depending on how much we would have generated so you would see that in a certain year we are likely to do more in terms of renovations that is if we would have generated more revenue,” said Mr Magodhi. Last year the park refurbished its self-contained tennis and basketball court, situated within the confines of the lodge. “A year ago we spruced up our basketball-tennis court and people like it. We are actually looking at families and corporate on team building to utilise that facility. It can also be hired by schools for tournaments,” said Mr Magodhi.